ExclusiveLane 'Simply Ethnic' Hand-Painted Round Shaped Bowls In Wood (Set Of 3)"
We are proud to present premium quality wooden bowl sets that are made from extraordinary sheesham wood that is procured from the top cultivators and timber retailers. 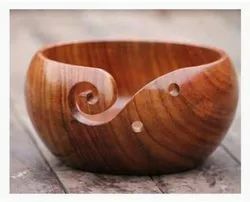 The wooden bowl set offered by us have been great hit in the market due to the exceptional carvings and brass done on them by our expert craftsmen. 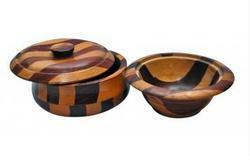 Antique wooden bowl , made up of mango wood with gold plated handle.Best option to serve fruits , salads and pasta.